The leading-edge liposome product from the SkinIdent research team. It leaves nothing to be desired. LIPOSOME SUPER combines all of the benefits of both LIPOSOME CERAMID and LIPOSOME VITAMIN. Liposome Super has the added effect of valuable phytosphingosin, which is very important for the skin to function properly. 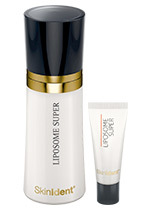 LIPOSOME SUPER is the perfect skincare product for all skin types and every skin problem.